Walt Disney is the famous name behind Mickey Mouse, Disney Land, Disney World, and namesake of the Disney company, which includes the ABC and ESPN networks, movie studios, and real estate throughout the world. When people win a professional sporting event, they often exclaim, "I'm going to Disney World!" How To Be Like Walt was written by Pat Williams with Jim Denney. The authors interviewed a variety of people who knew and worked with Walt Disney. Additionally, the authors reviewed a significant amount of archival material. While the book is a biography of Walt Disney, the authors gleaned lessons from each of the major milestones in Walt Disney's life. Walt was an incredibly driven and creative individual. He pioneered animation techniques still used today. Beyond simple animation, he envisioned a time when people would watch full-length animated movies, not just a short cartoon. This was completely unheard of when Walt started in the animation business. Below are two animated shorts created by Walt Disney. Although known as the creator of Mickey Mouse, Walt created Oswald the Rabbit at an earlier time in his career. Like all of us, his approach and decisions were often based - at least in part - on his personal life experiences. Born in a family with a father who frequently tried and failed at various jobs, Walt was not afraid to start again when a business venture failed. When Walt was animating Oswald the Rabbit, he became mired in a bad financial deal. As a result, he vowed to never work for someone else again. Hence the Disney company was born. Walt's creativity expanded beyond simple animation and entertainment. He sought to use entertainment as a vehicle for knowledge. Thus, early on he envisioned the Epcot City of Tomorrow and used his influence and creativity for educational purposes. In 1955, after discussing space travel with Wernher Von Braun, one of the architects of Hitler's and subsequently the United States' missile programs, Walt created a movie entitled Man in Space. This presentation of space travel to the moon was influential in President John F. Kennedy's declared mission to put a man on the moon by 1970. Plus every experience ("plus" was Walt's word for continual quality improvement). Be a person of stick-to-it-ivity. Become a sponge for ideas. Ask yourself "How about tomorrow?" Live for the next generation. Make family your top priority. Be the person God made you to be. 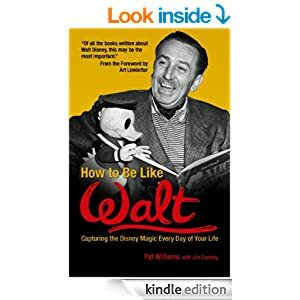 If you are interested in examples of creativity, inspiration for life, motivation for success, or simply enjoy a good story, I encourage you to read How To Be Like Walt.